Thanks for the tip, Meshelle! Talk about a way to NOT get laid! This is actually Step 6.5 for your "How Not To Get Laid" post right? Going dutch at White Castle on Valentine's Day is never going to get ANYONE laid. Or a date. I wish I knew what White Castle was so that I could get the joke. 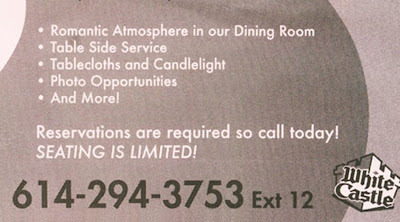 Although the fact that they feel the need to advertise 'tablecloths' gives me a pretty fair idea. Honestly, if we had White Castle here in the bayou, I'd take Mike. He's forever extolling the virtues of White Castle. It would be the world's best Valentine's Day present for him.